Today marks the centenary of the Returned & Services League of South Australia, the first to be established in Australia. One hundred years of service is a remarkable feat for any organisation. The RSL in South Australia can be rightly proud of what it has achieved since a small group of exservicemen gathered at the Cheer-Up Hut in Adelaide on December 8 1915. Their vision, so soon after wounded troops started returning home from the war front, was to ensure that veterans had a voice and were being looked after by the country they had served. That vision remains relevant to this day. At the inaugural meeting, Mr W.J. 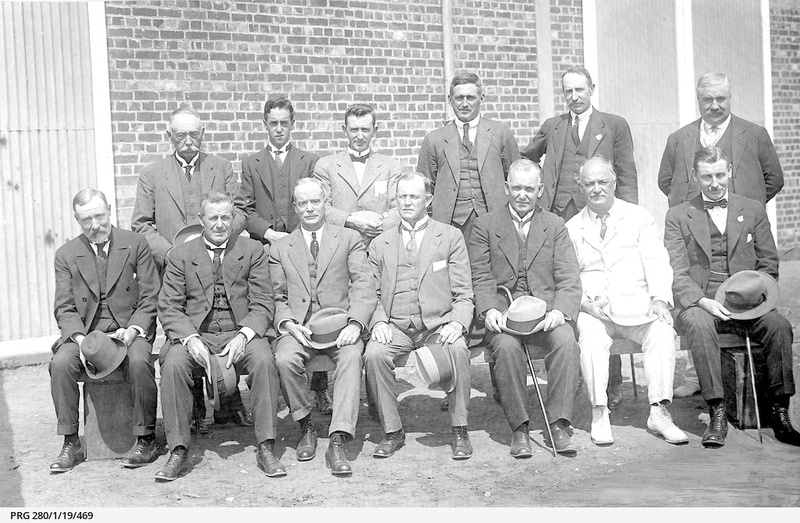 (later Sir William) Sowden was elected as the first president of the RSL’s predecessor organisation, the Returned Soldiers Association. He had no military background, having instead worked on newspapers for more than 40 years. At the time of assuming office, he was editor of the Adelaide daily newspaper The Register. His concern for the ex-service cause saw him also become SA president of the Australian Wattle Day League and chairman of the Violet Memory Day League. "On Thursday 19 February 1920 the Minister of Education, Hon. W. H. Harvey, paid an official visit to the trade schools of the returned soldiers' vocational training section of the Education Department. Standing left to right: Mr E.H. Bakewell (President of the employers' Federation), Mr S.L. Newport (Minister of Education's Department), Dr. Charles Fenner (Superintendent of Technical Education), Major L.A. Lewis (State Repatriation Department), Col. Weir, D.S.O. (Public Service Commissioner), and Mr F.W. Birrell (President of the Trades and Labour Council). Seated left to right: Mr J.A. Harper (President of the Chamber of Manufacturers), Mr G.R. Laffer M.P., Hon. E.A. Anstey (Minister of Repatriation), Mr W.H. Harvey (Minister of Education), Mr W.T. McCoy (Director of Education), Sir William Sowden (President of the Public Library, Museum and Art Gallery), Captain J.W. Bell (Deputy Comptroller of Repatriation)." State Library of South Australia, PRG 280/1/19/469. Their initiative inspired a positive response elsewhere. The first sub-branch was formed at Broken Hill in 1916, followed by Mt Gambier, Peterborough, Pt Pirie, and Gawler in 1917. Darwin RSL was also established in 1917, and became part of the RSL SA family. Having remained president in Adelaide until 1916, W.J. Sowden was succeeded by the Reverend J.C. McPhee, who had been senior chaplain to the 1st Australian Division in the Dardanelles. "Officers of the 10th Battalion visit the Sakkara Pyramids. Back row, left to right: Captain (Capt) George D Shaw; Major Frederick William Hurcombe VD, who later commanded the 50th Battalion; Captain Ross Blyth Jacob. Front row: Chaplain Colonel John Claude McPhee; Lieutenant Felix Gordon Giles DSO." Australian War Memorial A02140. The participation of experienced veterans in the RSA was quickly established. Perhaps South Australia’s most distinguished soldier from any era, the then Captain Arthur Blackburn VC, commenced his extended connection with the RSL in May 1917. He was elected as president in 1918 and served until 1920. He filled the role again from 1947 until 1950 as Brigadier Blackburn VC, after being a prisoner of the Japanese during World War 2. 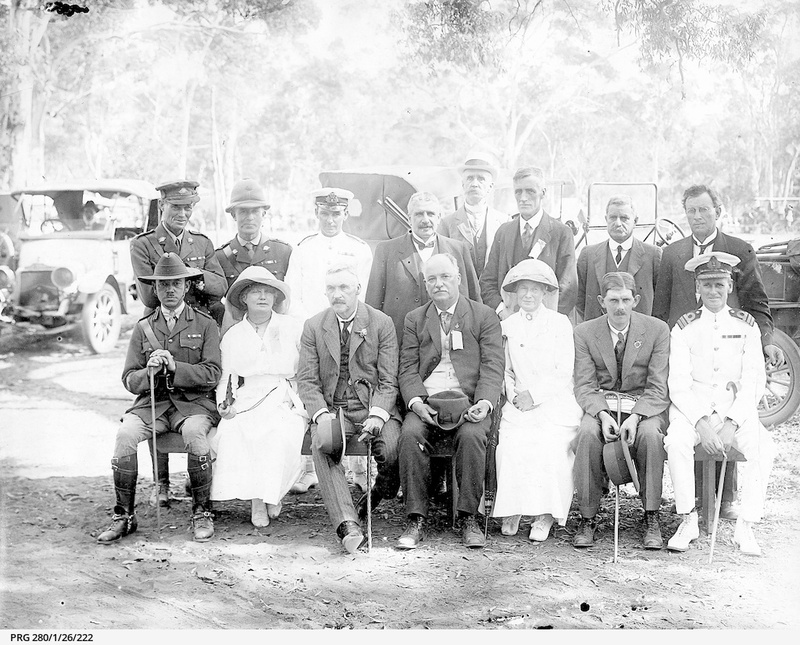 "A.H. Peake, Premier of South Australia sitting front row, third left with executive members of the Cheer Up Society and military officers; Mrs Seager and Sir William Sowden, co-founders of the Society sit either side of him with A.S. Blackburn, V.C. sitting second from the right next to Captain Bracegirdle, district naval officer." State Library of South Australia, PRG 280/1/26/222. • Perpetuate the ties of friendship created by service in the Australian Defence Force. • Preserve the memory and records of those who suffered and died. • Provide for the sick, wounded, and needy through pensions, medical attention, homes, and employment advocacy. Over the years the RSL has been proactive in the fundraising and building of memorials including the South Australian National War Memorial (1931), the Vietnam Veterans Memorial (2006) and the Aboriginal and Torres Strait Islander War Memorial (2013). It now has the country’s first virtual war memorial with over 600,000 military records online. In 2015 the RSL continues to serve a diverse membership base through a perpetually growing and innovative outreach protocol. The RSL offers free advocacy services to veterans, builds comradeship through its 134 sub-branches, supplies care and practical assistance to current and former Defence families at times of crisis, and works in conjunction with the Royal Society for the Blind to supply trained assistance dogs for veterans suffering stress-related illness. In a new development, responding to a particular challenge of the moment, it is now launching an emergency shelter program for homeless veterans. A century on, the RSL spirit maintains its strength and the enterprise remains vigilant.